West End Tattoo owner Tyrone “Red” Cooley is passionate about tattooing. And after seeing his mom suffer from lupus, he’s been just as serious about finding a cure for the auto-immune disease. Cooley will be tattooing for 24-hours straight for the third annual Stars for a Cure fundraiser Saturday-Sunday, June 9-10, starting at 1 p.m.
For each star tattoo — pick whatever color you like, but the theme is red in honor of his mom’s favorite hue — Cooley is asking a $40 donation. All proceeds will be given to the Lupus Foundation of America-Georgia Chapter. His goal is to raise at least $4,000. Contributions of all amounts are welcome, even if you decide a tattoo isn’t for you. 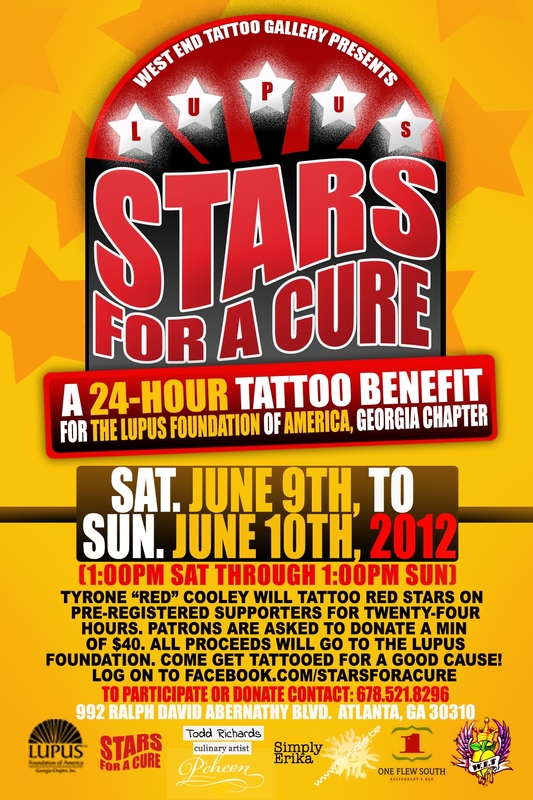 If you want to get tatted up for a cause, though, pre-register as soon as you can. The time slots are limited, so the earlier you register, the more likely you are to get your preferred time slot. I recommend the 9 p.m.-midnight slot, which will include Cooley’s birthday celebration. But then again, Cooley is raffling off a $200 gift certificate to West End Tattoo for anyone who registers for slots between 2-9 a.m.
Sponsors P’Cheen and One Flew South will be providing complimentary food and beverages at the height of the event. For more information on the event and West End Tattoo, check out the respective Facebook pages. Postscript: Cooley’s mom lost her battle with lupus late last year. Make it a priority to come support him.